If you’re looking to install a fence post, retain walls, foundation stamps, plant a tree or have to do some plumbing work, the tool you’re probably looking for is a post hole digger. 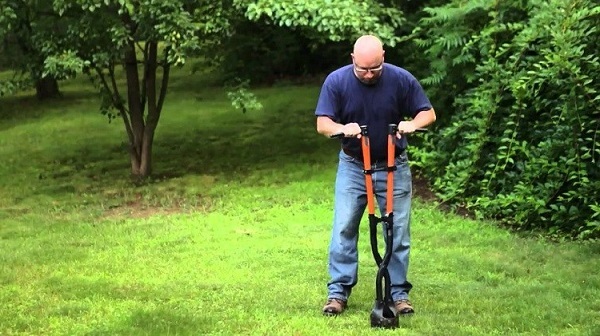 These are incredibly versatile and lightweight tools that are essential for anyone who cares about their landscape. It’s simple use of digging a hole can save you time and energy, and it’s a great affordable addition to the toolbox. For instance, instead of digging for hours with a shovel, you’ll achieve the same result, with more precision and accuracy with post hole diggers. Shoveling can be tiresome on your hands, and won’t bear the same results as this tool. Moreover, renting heavy-duty digging equipment can be quite costly if you need to use it frequently, so you’re best off investing in post hole diggers yourself, as they’re relatively inexpensive. The two most popular types of post hole diggers are traditional and gasoline-powered diggers. If you’re intending to dig a lot of holes in heavy-clay soils, then the gasoline-powered hole diggers are your best option. These tools feature an engine that operates on gasoline and a rotating threaded bit that drills into the ground, thus digging a hole. Generally, their engines range from 3 to 5 hp, they have an array of features, and are quite loud. These are the more expensive type, but there are some more affordable basic models. This type of hole diggers are manually operated, and require manual labour to be operated. They typically feature sharp blades that enable the operator to dig through dense soil with ease. Ideally, these models should have ergonomic handles to prevent the operators knuckles from banging together. Nowadays, these models aren’t as popular but they’re still the better solution than having to use a shovel. Whatever model you opt to go for, it should have a few features to make it more convenient to use. For example: comfortable handles which allow you to securely hold onto the tool are essential. The material it’s made from is also important and should be something durable like steel for example. If you need portability, look for a unit that’s not very heavy, so you can carry it around easier. And when it comes to the retailer, make sure they stand by their product with at least a one-year warranty. You can easily find these tools ranging from $20 to about $300, depending on the features, manufacturers and type.